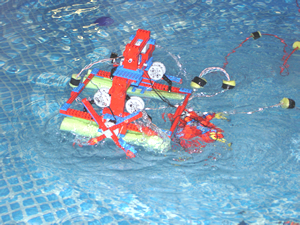 Designing a robot to explore under the water is a stimulating task to many students, from middle schoolers through adult learners. A large part of the fascination is due to the variety of challenges involved, with success depending on broad spectrum of knowledge and skills in three different fields — science, engineering and information technology (IT). Plus, the motion of an underwater vehicle, with six degrees of freedom, is more complex than any terrestrial vehicle design students may have encountered in typical robotics projects. Through the design, construction, programming and testing of underwater robotic vehicles, students will learn the iterative design process. Build IT emphasizes the pedagogical approach of discovery-based learning and collaborative teamwork, and will give students practical experience in systems thinking. The primary materials used in Build IT come from the LEGO Mindstorms and LEGO robotics kits. These consist of the usual LEGO bricks, connectors, gears, rods, etc. that most students have used before, and also include advanced microcontrollers, sensors and communication technologies, which will be new for most, if not all, participants. Some of the main advantages of using LEGO are familiarity, ease of collaboration and rapid on-the-fly redesign. The National Science Foundation’s (NSF) comprehensive Information Technology Experiences for Students and Teachers (ITEST) projects require that IT activities be integrated within existing science, mathematics, and technology courses of participating schools. Teachers will be given 144 hours of professional development training over 2.5 years of the project in order to assist them in implementing the equivalent of 15 class periods of project-based engineering and design work (building and programming the robots to perform in an underwater environment). In addition, project staff will provide three days of school-year professional development and on-site, classroom support to provide technical assistance and mentoring. For a list of current participants click here. Additionally, the project will foster science, engineering and IT career awareness among students, teachers, guidance counselors, administrators and parents. To that end, guidance counselors will be involved in several IT symposia and seminars to help build their understanding of the opportunities and foundations necessary for careers in these fields.